You have found a new job. You dislike your current job so much you can’t continue. You are returning to university/further study. If leaving for a new job elsewhere, be certain that the new role you have accepted is set in stone. Make sure your new employer has sent you a signed letter or contract detailing your pay, with a start date. Otherwise, it’s possible the new job could fall through and you will have made yourself redundant. Approach your boss - at the end of the working day is good - and ask for a moment to talk somewhere private. 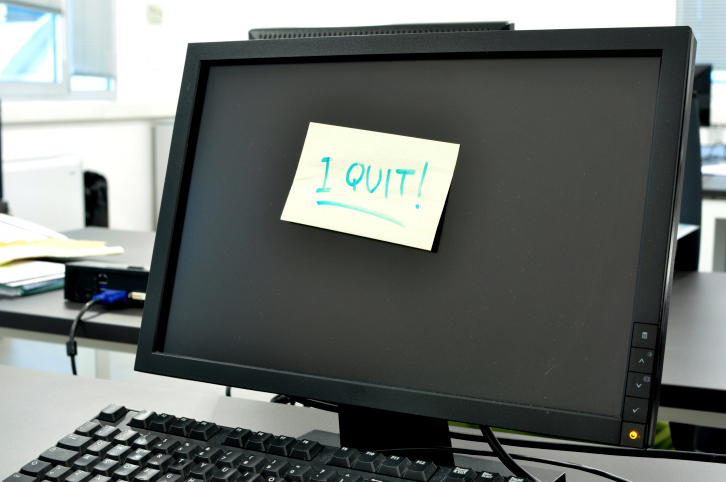 The next morning, drop a polished, professional resignation letter off at your boss’ office to back up the conversation and to let them know you are certain of your decision. Never resign by email. Not only is it bad manners but your boss may not see the email straightaway, leading to an anxious wait and subsequent awkward conversation. Break the news politely and calmly, without anger or blame. There is no point airing any negative feelings you have towards your manager, company or colleagues. You want to leave your job with good references and work out your notice period in as pleasant an atmosphere as possible. Emphasise positives – ways in which the company has benefitted you, things you have learned – rather than negatives. If your boss wants you to stay, you may be offered more money, a better office, extra benefits. You have made your decision, so stand firm. You are not obliged to divulge your exact reasons for leaving, so it’s useful to prepare a few generic explanations such as ‘I feel I have learned all I can’, ‘the time is right for me to move on’ or ‘I’m ready for a change’. You may be asked for an exit interview. Companies use these to glean feedback and information about their business practices in order to implement changes and improvements. You may be asked what influenced your decision to leave, and what your next company is offering you that they could not. An exit interview is mutually beneficial. Use this opportunity to obtain feedback about your strengths and weaknesses. Whatever your circumstances for resigning, consider your responses carefully. Even if you are leaving the company because you haven’t enjoyed working there for some time, again try to focus on the positives and use wording that means you won’t part company with your former employer on bad terms. The length of your notice period will be clearly set out in your contract, and you are not obliged to stay any longer than that length of time. If your boss demands you stay longer, contact your trade union who will be able to advise you on your options. Ever since the economic crisis started in 2008, the finance sector was becoming increasingly pressurised, and new management was brought in from the US who totally changed the culture of my company. The pressure grew so much that I was signed off with stress for a fortnight, during which time I began to consider options outside of finance. Once I started studying the Knowledge of London to become a cab driver, I had to decide when to resign. One day - a particularly stressful day at work - I called my boss into a meeting room and spoke honestly about my plans for a career change. I remained professional and polite, and there was no spilling of pent-up anger even though I was so unhappy. In fact, once I told him, it felt like a ten-tonne weight had been lifted off my shoulders. The relief to have finally resigned was immense. He congratulated me and seemed impressed and almost envious that I had an escape route planned from such a difficult environment.